Beautifully engraved certificate from the Pantepec Consolidated of Venezuela, Inc. issued in 1933. This historic document was printed by Central BankNote Company and has an ornate border around it with a vignette of an eagle perched on a rock. This item is hand signed by the Company's President, William Frank Buckley and Secretary, J. L. Barnett and is over 76 years old. 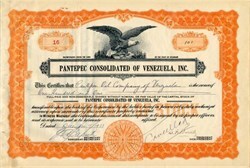 Pantepec Consolidated Company of Venezuela was a subsidiary company of the Pantepec Oil Company of Venezuela. In 1921, this same William Buckley, Sr. was expelled from Mexico by President Obregon under suspicion of working with American corporate interests to undermine the government. From the period 1914 � 1923 he was actively agitating for American oil interests by publishing articles on Mexican politics from the Oil perspective in American newspapers. Later in his life, he became involved in Israeli owned oil concerns. According to a summary published in American Free Press writer Michael Collins Piper�s book Final Judgment, Buckley Sr was responsible for the establishment of a business known as the Pan-Israel Oil Company in Jerusalem in the 1960s and a second business, the Israel-Mediterranean Oil Company in Panama, who�s principal address was the same as Pan-Israel Oil. Buckley�s son, former NY Senator turned Federal Judge James Buckley held a vice-presidential position in the business. The voting stockholders of both companies were all Israeli Jews. The companies also employed two of his sons � James and John Buckley, brother of William Buckley, Jr, who served in various executive and directorship positions. This conglomerate of corporations did oil business in Australia, South America, Canada, Libya, the Spanish Saharas, the Phillipines and Israel. During the 1950s, William Buckley Sr also set up the Cuban-Venezuelan Oil Voting Trust Company, which was alleged to have ties to the American-Jewish mafia, dominated then by Meyer Lansky, who served as an official American government representative to Cuba during the Batista dictatorship. It is said that his son, William Buckley Jr, became involved at this time with the CIA attempts to overthrow Castro, working as a CIA contact and informer during the period 1950 � 1954. Some have speculated Buckley, Jr, worked with the Cuban-Jewish exile community (5/6ths of the island�s Jewish population had been expelled by Castro in his wars against religion, drugs, gambling and prostitution), the American-Jewish mob, and Howard Hunt to arm and equip the anti-Castro resistance � an operation which culminated in the Bay of Pigs invasion. �I don't subscribe to the theory that there exists an organization of international bankers called the Bilderbergers." At the same time his brother William was on the invitation list to their annual meeting. "It was only by virtue of covert help by the United States that [Pinochet and CIA-backed factions] were able to survive in the face of increasingly repressive measures by the Allende regime." And of course in the Buckley family world what followed, the extermination of tens of thousands of left-wing organizers and dissidents, was not �repressive� at all. James Buckley also played a role in arranging the assassination of the Chilean Ambassador to the United States, Orlando Leteiler, in 1976. A week before the killing, he met with CIA-backed Chilean secret police assassins Michael Townley and Guillermo Novo in his New York office. When CIA agent David Atlee Phillips was implicated in this murder of this foreign diplomat on US soil, James Buckley sat on the Board of Directors for his defense fund. BUCKLEY, WILLIAM FRANK (1881-1958). William Frank Buckley, lawyer and oil entrepreneur, was born in Washington-on-the-Brazos, Texas, on July 12, 1881, the fourth of eight children of John and Mary Ann (Langford) Buckley, of Irish ancestry. In the fall of 1882 the family moved to San Diego, Duval County, where John Buckley engaged in merchandising, politics, and sheep raising; he also served several elective terms as Duval County sheriff. Growing up in a Spanish-speaking community, William Buckley became proficient in the language and a close friend of Spanish-speaking peoples, a quality he retained all of his life. One of his early influences was the widely educated parish priest, Father John Pierre Bard, of the Church of San Francisco de Paula in San Diego. After finishing school in San Diego, Buckley taught at a country school near Benavides, where all but a few of the students used the Spanish language. According to records at the University of Texas at Austin, he enrolled there in 1899 and was a student at the university until 1905, when his picture appeared with the law class of 1905. Because of his command of the language he received advanced credit in Spanish in his first years there and was an assistant to a professor in the Romance-languages department. During this time he was also, along with his sister, Priscilla, a Spanish translator in the General Land Office. qv With others he initiated the Austin chapter of the Delta Tau Delta national college fraternity and later became one of its most liberal financial supporters. He was a devout Catholic and, along with others, purchased property near the university for the Newman Club. When his father died in 1904 he was the oldest surviving son, and he undertook the care of his mother, whom he moved to Austin, along with his two brothers and two sisters, to a small house on the corner of Lavaca and Nineteenth streets; Buckley later built a large house there (now the site of Cambridge Tower), where his mother lived until her death in 1930. He received a B.S. degree in 1904 and an LL.B. degree in 1905, was quizmaster in the School of Law, and was a member of the John C. Townesqv Law Society. In 1905 he was elected editor of the University of Texas yearbook, The Cactus (1906). Buckley received his license to practice law in Texas on June 8, 1906, and he was elected a member of the Texas Bar Association (see state bar of texas) in 1909. He went to Mexico City in 1908 and passed law examinations there, and he and his brother Claude, also a lawyer, acted as counsel for many of the most important American and European oil companies doing business in Mexico. In 1911 they established their own law office with another brother, Edmund, in Tampico, Tamaulipas. By 1914 William F. Buckley had turned his law practice over to his brothers so that he might engage in real estate and the leasing of oil lands. He acquired, improved, and sold land around the city of Tampico, and he founded the Pantepec Oil Company of Mexico. The Mexican Revolutionqv was at its height in 1912, 1913, and 1914, and after the invasion and takeover of Veracruz by the United States Marines in April 1914, President Woodrow Wilson offered the post of civil governor to Buckley, who indignantly refused the appointment because he was not in sympathy with Wilson's Mexico policy. Later that year Buckley served as counsel for the Mexican government at the ABC Conference at Niagara Falls, where Argentina, Brazil, and Chile acted as mediators between the United States and Mexico. In December 1919 he testified before the United States Senate Subcommittee on Foreign Relations as an expert witness on conditions in Mexico. Knowing the language, the people, and the nature of revolutionary activities there, Buckley believed that internal Mexican policies such as those approved of by American "specialists" would destroy American investments in Mexico. In 1920 he assisted in the foundation of the American Association of Mexico, with offices in Washington and New York, which lobbied for the interests of United States businessmen in Mexico. Because of Buckley's opposition to the government of Gen. �lvaro Obreg�n and his support of the antigovernment revolution of Manuel Pel�ez, Buckley was expelled from Mexico in 1921. In January 1922 he gave a full report of his expulsion to the secretary of state of the United States and urged that his country not recognize the Obreg�n government until certain agreements had been reached between the two countries. BIBLIOGRAPHY: Priscilla L. Buckley and William F. Buckley, Jr., eds., W. F. B.�An Appreciation by His Family and Friends (New York, 1959). Handbook of Texas Online, s.v. "BUCKLEY, WILLIAM FRANK," http://www.tsha.utexas.edu/handbook/online/articles/view/BB/fbu8.html (accessed January 5, 2005).